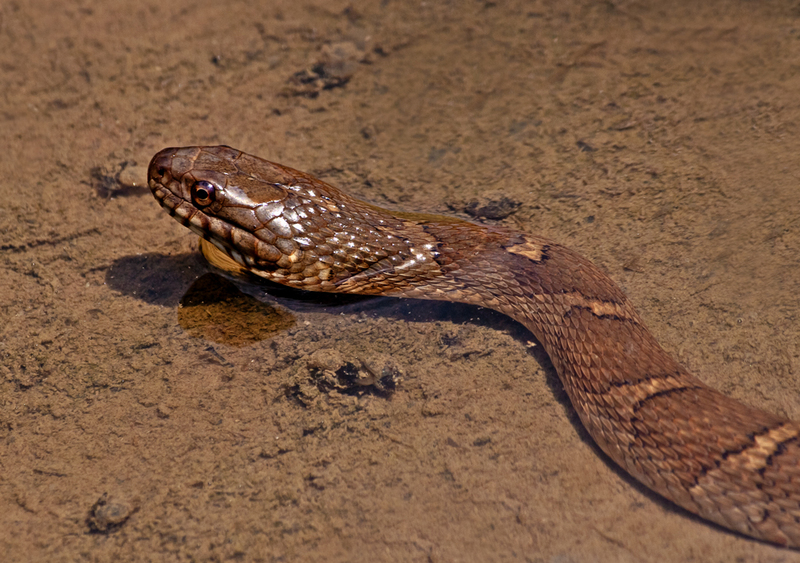 Soaring summer temperatures have caused the water level in some areas of my marshland park to drop and Northern Water snakes (Nerodia sipedon) can now be seen trolling these shallow waters for prey. 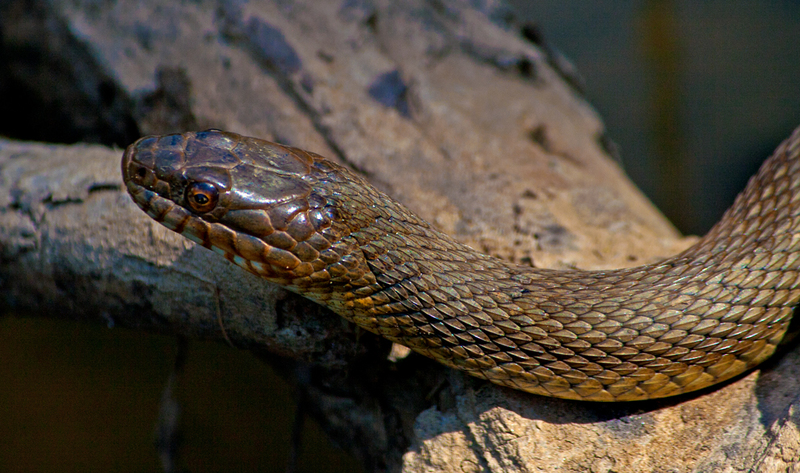 Yesterday, in one small area I saw three of these snakes and managed to get shots of two them. Sometimes the snakes will sit on brush and logs just above the level of the water, as in the first photo, while in other cases they submerge their bodies in the water, with their heads sticking out of the water, as in the second photo. I like the way that the first image shows the details of the snake’s scales and like how the second photo highlights the marking on the snake’s body (and realize that some folks may find both images to be creepy). Why do hawks scream? 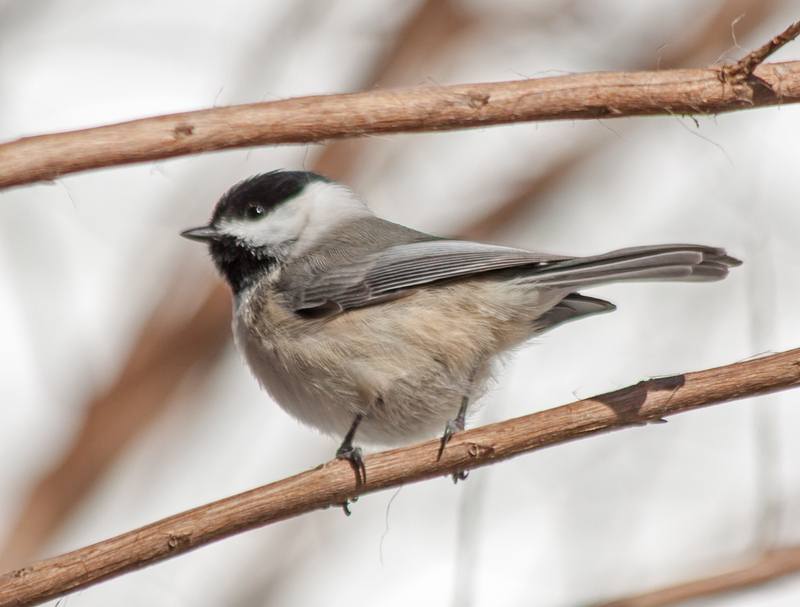 That question ran through my head yesterday during a visit to a local garden, when the call of a hawk rang out almost continuously for long periods of time. 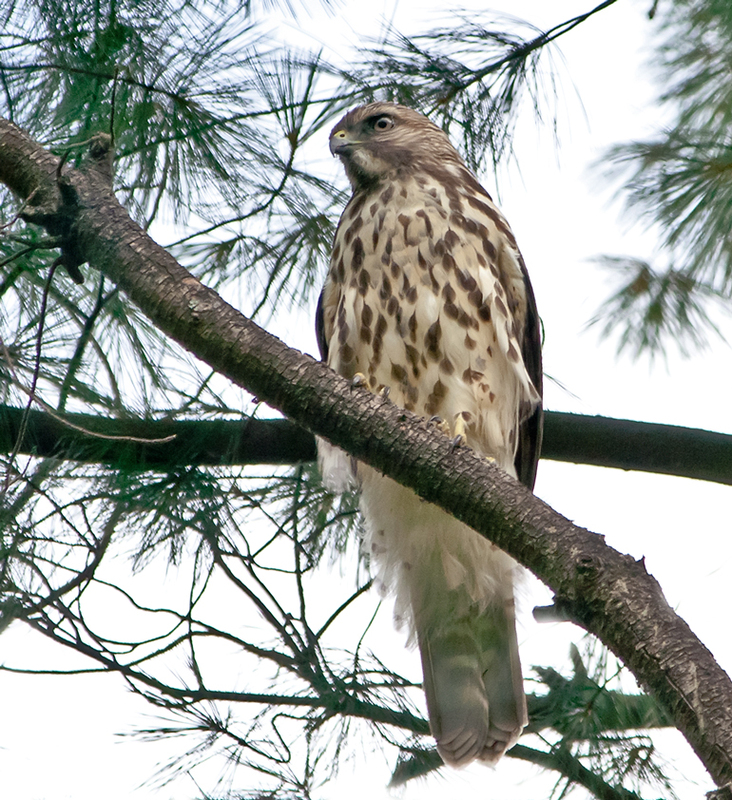 Twice I managed to see the hawk, which I think may be a Red-tailed hawk (Buteo jamaicensis) and got some shots of it. Although I was able to get a shot of the hawk perched on the limb of the tree (the second photo here), I prefer the first image. 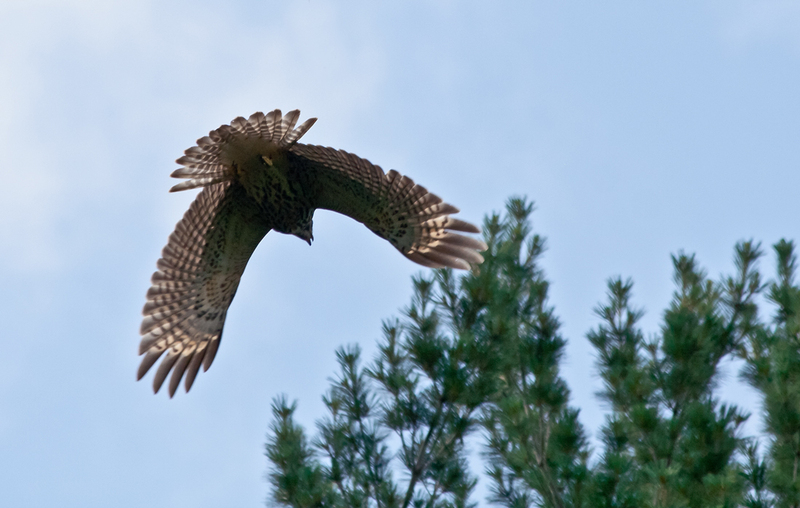 I had observed the hawk flying to the branches of a tree that was relatively near to where I was. The photographic challenge for me was that the hawk was mostly in the shade and the sharp upward angle made it tough to get a good shot. After a few minutes on the branch, the hawk took off and I got a couple of photographs before the hawk disappeared into the trees. I really like the outstretched wings and tail of the hawk as it took to the air. Note too that the hawk’s mouth is open—I think he was still screaming. 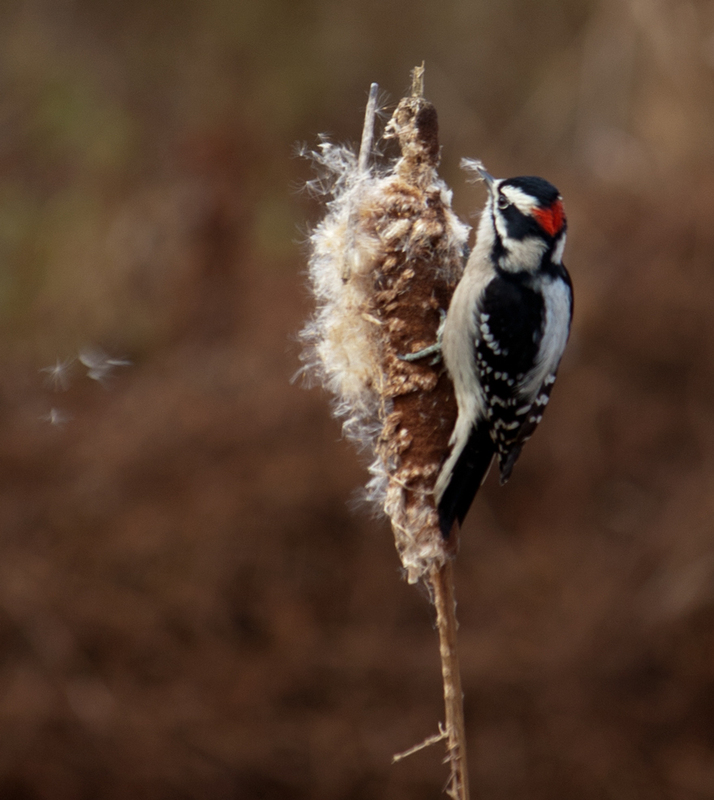 If I were a woodpecker, I would want to be a male Downy woodpecker (Picoides pubescens) and slam my head into something soft as a pillow—like this cattail—and not always into solid wood. 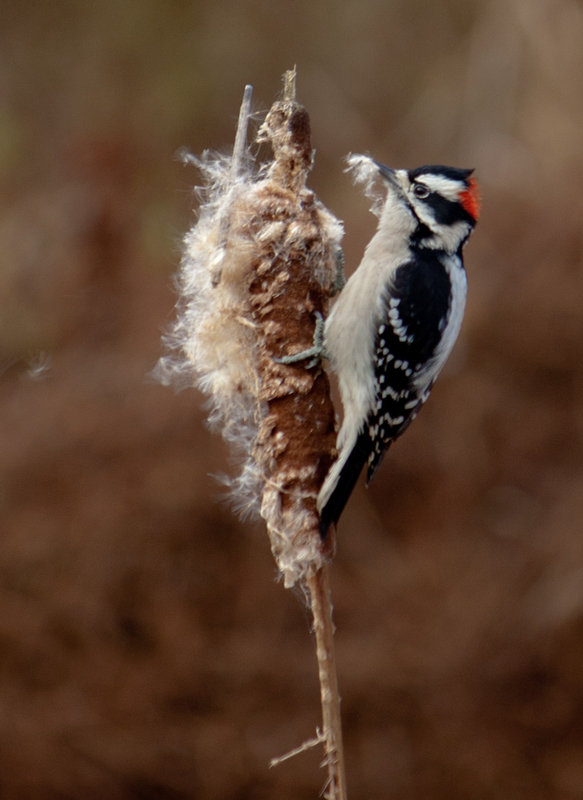 Of course, you can end up with a mouthful of cattail fibers, and not just a tasty bug. More seriously, scientists are doing research to figure out why woodpeckers don’t end up with concussions, given that they can slam their heads into wood with the force of 1,000 times that of gravity, according to an article on livescience.com. By comparison, humans can survive a force of up to G’s, according to Air Force research, though there are reports of race car drivers surviving a force of over 100 G’s. According to the article, Chinese researchers are studying the microscopic structure of the bones surrounding the brain and also the beak to try to understand how the woodpecker’s brain is protected. If you are interested in the research, an article on a website called Inkfish explains in layman’s terms the research methodology and some of the preliminary conclusions. The world seems changed after the rain. 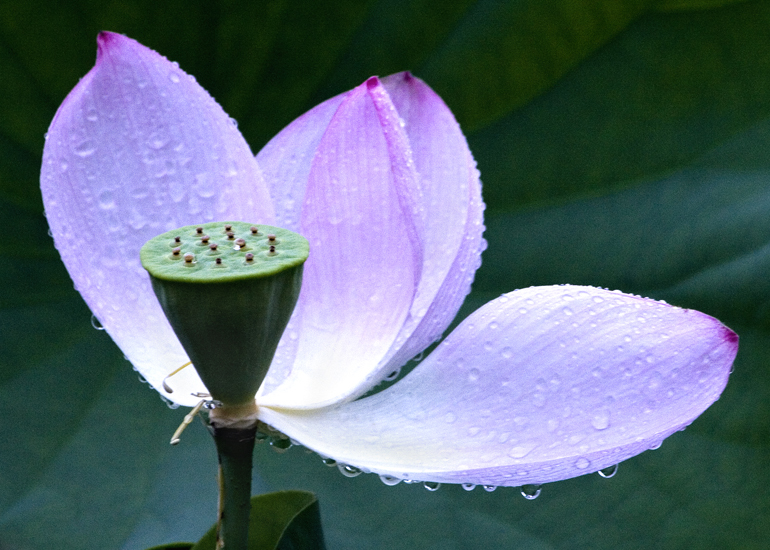 The falling rain stripped some of the delicate petals from this lotus flower but left behind a glistening trail of water. From the perspective of beauty it seems like an equitable trade—the transformed flower still takes my breath away.